MANEJAMOS TODO TIPO DE ENVENTOS, BODAS, XV AÑOS, GRADUACIONES, BAUTIZOS, ETC. MANEJAMOS DIFERENTES MENUS DESDE 4 TIEMPOS HASTA TAQUITOS DE PASTOR Y DE BISTEC. 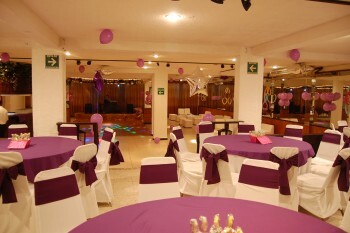 REALIZAMOS CUALQUIER EVENTO DE ACUERDO A TUS GUSTOS NECESIDADES, SABEMOS DE ANTEMANO QUE CUALQUIER EVENTO ES SUMAMENTE IMPORTANTE, POR LO QUE LO REALIZAMOS CON MENU FORMAL 4 TIEMPOS, 3 TIEMPOS, TAQUIZAS, INFORMALES, EN FIN TENEMOS MUCHOS PAQUETES, MANTELERIA, MONTAJES Y TODO DE ACUERDO A COMO LO QUIERAS REALIZAR, POR LO MISMO NOSOTROS SOLO MANEJAMOS UN EVENTO AL DIA, PARA QUE ESE DIA QUE ES EL MAS IMPORTANTE PARA TI LO SEA PARA NOSOTROS PODEMOS ADORNAR EL SALON A TU GUSTO.